As much as middle school is a strange experience for everyone, I attended a particularly unusual little place. Essentially, all of us from fifth through eighth grade sat together. This allowed for the fair exchange of ideas between ten and thirteen year-olds, so… you can imagine. The curriculum was an interesting amalgam of what the head administrator felt we ought to learn mixed with what the available faculty could teach. Some parents taught at the local university or had other advanced training and spent an hour at the school a couple times per week teaching us something. On the other hand, I’m pretty sure our teacher for music appreciation was basically winging it by reading just ahead of us in a book and finding something for us to listen to for fifteen minutes. I can’t complain, though sometimes I still do. Berlioz became a thing for me because of those classes and a performance by the Youngstown Symphony. Leonard Bernstein also attracted my notice, but he seemed to confuse the teacher as much as any of us. Then, his personal life erupted into public view. If only we hadn’t been required to read Time magazine for our Current Events class… So, we stopped talking about Bernstein. Bernstein was hard to ignore. West Side Story kept popping up. My father even appeared in a production as the store keep. You haven’t lived all possible father/son moments until you’re in the audience watching your dad discover that the door on the set has stuck closed and the rest of the cast can’t enter. 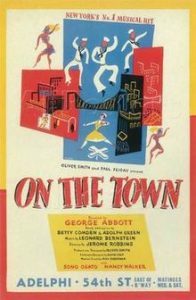 On the Town just… it is pretty much what the word “delight” was invented for. But that odd dropping out of Bernstein from that middle school class meant it took a little longer to find out what a great conductor and all-around composer he was. There is something pleasurable about discovering more by someone that you enjoy, but there’s always a little odd sense that you missed out when you might have most appreciated it. I was ready for the drama and brilliance of Berlioz. I could have handled the theatricality of Bernstein. And his peccadilloes seem passe now. You’ve Got to Check This Out is a blog series about music, words, and all sorts of artistic matters. It started with an explanation. 59 more to go.